Seondeok (Sŏndŏk) reigned as Queen of Silla, one of the Three Kingdoms of Korea, from 632 to 647. She was Silla's twenty-seventh ruler, and the first of three queens to rule Silla. She reigned near the end of the Three Kingdoms period, when there was much fighting between Silla, Baekje and Goguryeo, and also with the Tang Chinese. Queen Seondeok used her intuition, wits and charm to run the country, and to keep it strong in the battle with the other two kingdoms. During her reign, Buddhism flourished, and Seon (Zen) Buddhism was introduced to Korea. Culture and learning also advanced under her leadership. It was just a few decades after her reign that Silla gained control of Baekje and Goguryeo and Unified the entire southern part of the Korean peninsula for the first time. King Jinpyeong and his advisors faced a tremendous dilemma when it came time for him to choose a sucessor. Jinpyeong had reigned for more than 40 years, and had three daughters, but no sons. He sent his queen to a Buddhist nunnery and took another queen, but to no avail, she also did not bear him any sons. During the Silla Dynasty, only persons of pure Seonggol rank (with two parents of Seonggol rank) could become king. It was getting harder and harder to fulfill this requirement as the number of Seonggols gradually declined, and King Jinpyeong's daughters and niece Seungman (later Queen Jindeok) were the only qualified Seonggol rank candidates available. The most qualified male candidate was Jingol rank Yongchun Kim. Finally, Seondeok's Seonggol rank and her intelligence led Jinpyeong and his advisors to select Seondeok as his heir. Even though Silla's society afforded women of the period a certain degree of influence as advisors, dowager queens, and regents, it was an unusual move. Silla women were heads of families since matrilineal lines of descent existed alongside patrilineal ones, and the Confucian model, which placed women in a subordinate position within the family, was not to have a major impact in Korea until centuries later, during the Joseon period, so during the Silla kingdom, women's status remained relatively high. However, a woman had never been chosen as monarch before, and Jinpyeong and his advisors contemplated long and hard before selecting Seondeok. Just a few decades later, there were no longer any Seonggol candidates available, and the throne passed to a Jingol man. In 634, Seondeok became the sole ruler of Silla, and ruled until 647. She was the first of three female rulers of the kingdom, and was immediately succeeded by her cousin Jindeok (Chindŏk), who ruled until 654. Like Queen Elizabeth I of England, Seondeok encouraged a renaissance in thought, literature and the arts that had a strong impact on Silla culture. She also encouraged balance between Korean's divergent religious groups. The period during which Seondeok reigned was a violent one; rebellions and fighting in the neighboring kingdom of Baekje filled her days. Yet, in her 14 years as queen of Korea, she used her position of power to great advantage. She kept the kingdom together and extended its ties to China, sending scholars there to learn. model showing the scale of the wooden pagoda at Hwangryongsa. built after the miracle of Yi Ch'a-don's faith, took 93 years to construct and was completed in 645, during Queen Seondeok's reign. Hwangnyongsa is known for its enormous wooden pagoda, which was 224 feet high, and 78 feet square, with eight stone pillars per side, and 60 foundation stones. Nothing is left of it except the foundation stones, but reconstructed models show what it must have looked like. Tongdosa Temple was founded in the fifteenth year of Queen Seondeok's reign (634) by Master Jajang. Jajang had brought back relics of the Buddha from China when he returned from studying his faith there, and these relics are enshrined in Tongdosa as the central focus of faith, making Tongdosa on of the few Buddhist temples that does not have a statue of Buddha in the main prayer hall. Tongdosa is known as one of the three jewel temples of Korea, representing the Buddha. Buinsa Temple an affiliate temple of Tongdosa was built in the seventh century with a Seondeokmyo shrine to Queen Seondeok, where memorial rituals are still held for her every year. Diamond Precepts Altar, with a bell-shaped stupa believed to contain relics of the Buddha, the main representation of Buddha on the Tongdosa Temple grounds. Woljungsa is one of the main temples of the Jogye Order and was also built by Master Jajang. Jikjisa Temple (Direct Pointing Temple) was originally established around 418, and was rebuilt by Master Jajang in 645, and the sermon hall of Chongsu Temple is said to have been constructed in 639. Another temple founded by Master Jajang during Seondeok's reign is Samhwasa or Mureung Dowon in the Mureung Valley. It was originally named Heukryeondae (Black Lotus Temple) but renamed Samhwasa (Three Harmonies Temple) in honor of three female spirits who assisted Jajang during the construction of the temple. Jajang is also credited with founding Woljeongsa and Sangwonsa temples on Mt. Odae, a mountain which he believed to be the abode of Manjusuri Bodhisattva. Chiljangsa Temple was established by Master Jajang in the fifth year of Queen Seondeok. Kejo-am, an annex to Sinheungsa Temple on Mount Seorak, was built by Jajang in the ninth year of Queen Seondeok. Huibangsa Temple was built by the monk Tuun in 643. Bogwangsa in the foothills of Goryeongsan in Paju was founded by Master Doseon by direction of Queen Seondeok. 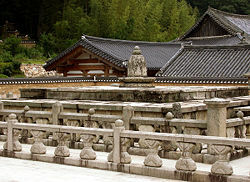 Beopwangsa Temple was founded in the third year of Queen Seondeok by Master Hyeonjang. Punhwangsa was one of the four most famous temples in pre-unification Silla. Remaining from Punhwangsa is the Punwhangsa Pagoda, with rectangular door openings in the base, with carved Buddhist guardians guarding the doors. After being destroyed in 1915, the pagoda has been rebuilt as a three-story pagoda, but originally it was a seven or nine-story pagoda. Inside the pagoda were discovered a reliquary, probably of Silla origin, and other artifacts possibly dating back to Seondeok's time. Punwhangsa Pagoda on the grounds of the former Punwhangsa Temple. Bomunsa Temple at Seokmodo Island, west of Ganghwado Island is said to have been constructed by Queen Seondeok in 635. It is also said that Hallasan's Seondeoksa Temple was probably named after Queen Seondeok. Mangwolsa Temple was constructed in year 8 of Queen Seondeok's reign, facing Silla's capital, and is said to have blessed the Silla Dynasty with prosperity. Legend also tells us that Queen Seondeok built Namyang Temple to enshrine the sarira of Buddhist Priest Daegu. Cheomseongdae Observatory, built during Queen Seondeok's reign. In addition to her interest in Buddhism, Queen Seondeok was also very interested in various cultural areas, including astronomy and Chinese culture. She introduced Chinese court dress and customs and sent talented students and scholars from the kingdom to study in China. This helped Silla to strengthen its ties with Tang Dynasty of China, an alliance that would later help Silla to be victorious in battle against Baekje and Goguryeo. She also sent many young Hwarang warriors to study martial arts in China. These expert fighters later helped Silla to avoid being conquered by the Tang Chinese. 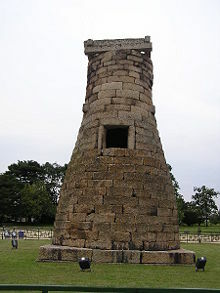 Seondeok's interest in astronomy led her to have the Tower of the Moon and Stars, or Cheomseongdae(designated National Treasure #31). Built in 634, it is the oldest existing observatory in the Far East, located in the old Silla capital of Gyeongju, South Korea. 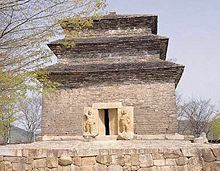 The shape of the observatory is thought to be based on the Chinese theory of 'round-heaven, square-earth', with 27 levels of stones (Queen Seonduk was the 27th ruler of the Silla Dynasty) and four sets of parallel bars to make a square-shaped structure on its top. The ends of the parallel bars jut out several inches from the surface and might have been a support for a staircase used to reach the top. The 12 rectangular base stones are positioned in a square, three on each side, representing the four seasons and twelve months of each year. It is believed that Seondok's selection as her father's successor were attributed to displays of perceptive intelligence in childhood. One such story entails that when she was seven years old, her father received a box of peony seeds from the emperor of China accompanied by a painting of what the flowers looked like. Looking at the picture, Seondeok remarked that while the flower was pretty it was too bad that it did not smell. "If it did, there would be butterflies and bees around the flower in the painting." Her observation about the peonies' lack of smell proved correct, one illustration among many of her intelligence, which confirmed her ability to rule. There are two other accounts of Seondok's unusual ability to perceive events before their occurrence. In one account, it is said that Seondok once heard a hoard of white frogs croaking by the Jade Gate pond in the winter. Seondok interpreted this to indicate an impending attack from the Kingdom of Baekche (the croaking frogs were seen as angry soldiers) to the northwest (derived white symbolizing the west in astronomy) of Silla at the Woman's Valley (interpreted from the Jade Gate, a term related to women). When she sent her generals to the Woman's Valley, they were able to successfully capture 2,000 Baekche soldiers. The second account involved the prediction of the exact day, almost to the minute, of her own death at 37 years of age. Seondeok died without an heir and the throne passed to her cousin, Queen Jindeok, who reigned from 647-654. 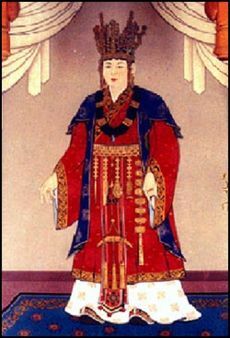 One of Seondeok's sisters, Chonmyoung, married Kim Yongchun(김용춘, 金龍春), the son of King Jinju (진지왕, 真智王) of Silla, who had reigned from 576-579. Because Jinji had been was overthrown, his son Kim Yongchun was ineligible to be king. However, as Kim Yongchun was of seonggol or sacred blood rank, and he married a princess, who was also seonggol, their son, Kim Chunchu (김춘추 金春秋) was born with the rank of seonggol, and when Queen Jindeok died without an heir, Kim Chunchu was chosen as Silla's 29th monarch and reigned as King Taejong Muyeol (태종 무열왕 太宗 武烈王) from 654 to 661. He is credited for leading the unification of the Three Kingdoms of Korea. According to some records, Seondeok's other sister became Queen Seonhwa of Baekje by marrying Baekje's King Mu (무왕; 武王), the thirtieth King of Baekje, and gave birth to a son who became Baekje's final reigning monarch, Uija of Baekje, who was King of Baekje when Baekje was overthrown by the Silla - Tang alliance in 680. 57 B.C.E. - 654 C.E. "Queen Sondok (or Sonduk)" Women in World History. Retrieved November 21, 2007. material from the source: Yung-Chung Kim. Women of Korea - A History from Ancient Times to 1945. Seoul: EWHA Women's University Press, 1997. Jennie Ngoc Vu. "Queen Sondok" Pacific University: Queen Sondok. Retrieved November 21, 2007. Martin K.I. Christensen Guide to Woman Leaders. Retrieved November 21, 2007. History of "Queen Seondeok of Silla"
This page was last modified on 19 June 2015, at 14:46.